A few days ago, Deputy Finance Minister Datuk Amiruddin Hamzah announced that a digital service tax will be implemented at a fixed rate of 6% per year, with estimates rounding off to RM 500,000. 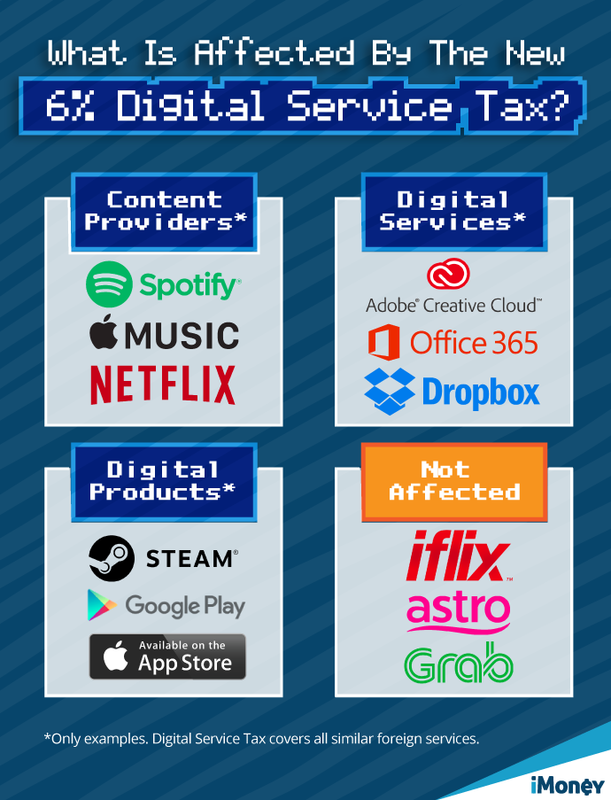 Obviously that shocked netizens, as now it seems the average household will have to pay a little bit more to enjoy their Netflix, Spotify, Steam, Garena, or Amazon Prime subscriptions. “The digital tax is to provide a level playing field among local and foreign companies, as well as between online and offline service providers,” said Amiruddin. iMoney has provided a handy infographic on which products are affected. From the looks of it, all incoming traffic from outside looks to have hit a tax gate, whereas local companies such as iflix, Astro, and Grab won’t be penalised. Now, given that most subscription services are relatively inexpensive from a price standpoint, consumers will have to pay a little bit more (around RM 4 – RM 5 extra) depending on the amount.